This guide will show you how you can easily build packages for PlexyDesk and upload them to your ppa. 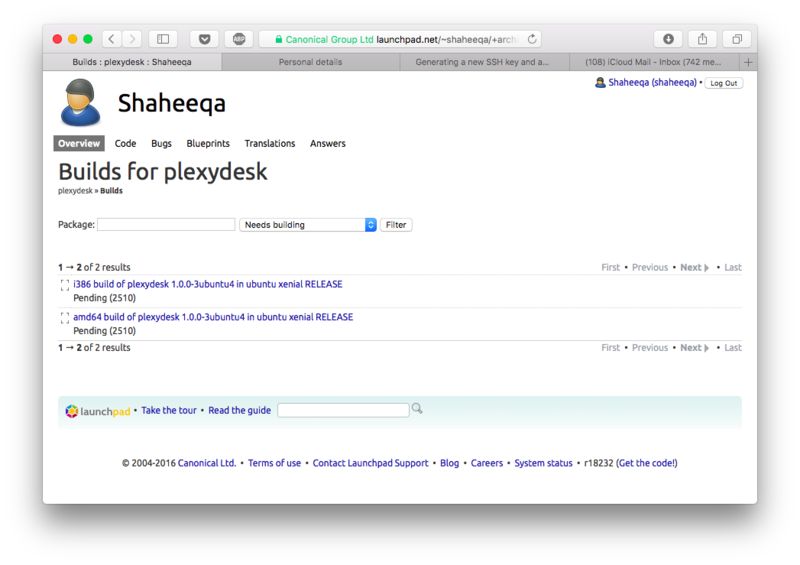 This article was created by updating and adapting the ubuntu PPA guide to fit the needs of PlexyDesk source package. If you would like to learn about generic packaging instructions on creating a PPA for your source package, it's recommended that you follow the original post linked at the end of this article. Software must be free according to Launchpad's licensing guidelines. Each PPA gets 2 GB of disk space. If you need more space for a particular PPA, this can be arranged through Launchpad admins. As Launchpad has a limited amount of package build machines, the build queue can at times be clogged, so it might take longer until your packages are built, but normally you can expect built packages within an hour. Setting up your GPG key. Before you can publish to Launhpad.net you must first setup GPG on the build system. If you already have a GPG key you can import it to the build server, or you can create a new key and submit the new key to launchpad.net Once your user profile is set up you can continue with the tutorial. For the benefit of those who do not own a GPG key, follow the instructions to create and publish your first GPG key. Before invoking the GPG command, install rag-tools, if your system doesn't have it already. This will help you collect the required entropy to finalize the key. After installing the run the following command. After it finishes invoke gpg binary to start the process of creating your GPG key. We will select Option (1) to generate both private and public keys. In the next prompt select the key size. If you are happy with 2048, just press the enter key. Next Choose when the key will expire. It is a good idea to choose an expiration date instead of using the default, which is none. If, for example, the email address on the key becomes invalid, an expiration date will remind others to stop using that public key. Finally before finishing the process it will prompt you to confirm if all the details provided are correct. In this section we are going to build PlexyDesk version v1.0.3, To start we will clone the source code from github.com with the following command. remote: Counting objects: 52492, done. Receiving objects: 100% (52492/52492), 82.07 MiB | 2.36 MiB/s, done. Resolving deltas: 100% (35599/35599), done. Branch origin/v1.0.3 set up to track local branch master. PlexyDesk comes with a script which makes it easy for you to prepare the source code for Debian/Ubuntu, We will run the script to create the required changes automatically. Now we need to update the change log before submitting the packages. Add the details about the change and save and close the editor. Now we are all set to proceed to the next step by changing in the directory INSTALLERS/deb and run the following command to submit the package to launchpad. If you followed everything correctly you should receive an email from launchpad.net, stating the state of the package. gpg: Good signature from "Shaheeqa Siraj "
Now you can visit launchpad.net to check the build status of the package and you can start distributing and informing your friends about the availability of the package.